Each year 2.5 million French Presses are sold in the United States alone. That’s one French Press sold for every 100 US adults every single year. Considering many French Press users own theirs for 10-plus years, clearly we’re talking about a large portion of the American public. The AeroPress is no slouch either. Almost accidentally invented, the small business that launched the revolutionary brewer has sold millions since 2005. AeroPress vs French Press — which is right for you? We break it down in The Coffee Maven’s AeroPress vs French Press Ultimate Showdown. 2 What is the AeroPress? 3 What is a French Press? 4 AeroPress vs French Press: What Do You Think? Both are cherished by their loyal followings and produce undeniably outstanding coffee, but they proudly sit on opposite ends of the brewing spectrum. The AeroPress was invented in 2005 and is the new school brewing method. It uses pressure extraction with medium-fine grounds to quickly product a bright, clean brew one cup at a time. The French Press was first patented in 1929 and is the old school, tried-and-true brewing method. 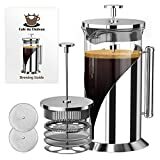 It uses full immersion with coarse grounds to extract every precious oil and uses a paper-free plunger to separate the solid matter from the coffee to yield a full-bodied, raw, almost unrefined beverage bursting with flavor. The AeroPress is a new take brewing coffee invented by Aerobie, the company that holds the Guinness world record for longest frisbee toss. You can find some cool videos of their aerodynamic sailing ring on YouTube. The main point: these guys know their physics. And it’s those physics that make the AeroPress so amazing. How Does the AeroPress Work? Similar in concept to espresso machines, the AeroPress combines coffee grounds, hot water and pressure to aid extraction. The pressure is generated completely by hand as you compress the coffee between the plunger and the ground coffee bed/micro-filter. You won’t generate the 9 bars required for authentic espresso, but Aerobie says you can generate between 0.35-0.70 bar. That sounds small, but it’s the reason you can speedily make espresso-like concentrates. Besides, the French Press doesn’t have any applied pressure! From left to right you have the plunger, chamber and filter cap. The AeroPress isn’t difficult to use, but mastering it can take some time. Here’s the process. Stir briefly: Give it a quick stir; don’t linger! That’s all there is to it! Ten steps seems like a lot, but I basically covered every single unique motion. Depending how long it takes your water to boil or your coffee to be ground, that whole process could take anywhere from 2-5 minutes. But here’s the catch, that’s only the Standard Method. The steps and video above show what’s called the Standard Method. It’s the original way of using the AeroPress as designed by the inventor. Some prefer a different method: the Inverted Method. This method is characterized by, unsurprisingly, inverting the chamber. The steps are similar to those of the Standard Method, except you connect the plunger to the chamber first, then invert it and pour the coffee grounds in. This time the last thing you add is the filter cap and damp paper filter! Some AeroPress users like to give the coffee more extraction time, but with the Standard Method this means you get underextracted coffee dripping through the filter into your mug. By inverting the AeroPress and brewing with the plunger on the bottom, you eliminate all dripping. However, inverted brewers are left with the task of re-inverting the hot mixture in order to finish plunging. These are the steps (much of it will look the same as above). The Inverted Method requires a little more in the way of acrobatics and coordination, but it may be right for you. 1. AeroPress recommends using water at 175ºF versus the standard 200ºF-205ºF (or higher for some). The 30ºF difference in water temp will yield a coffee with hardly any bitterness, which seems to be how the AeroPress inventor likes his coffee. I say try it to see what you prefer. 2. Use a fine or medium-fine grind, which will create the optimal density for the bed of grounds. Be careful not to go too fine or you won’t be able to press the plunger down. 3. For longer extraction time, try the Inverted Method. This method prevents water from dripping through the bed of coffee grounds. I’m a card carrying member of the AeroPress fan club for the following reasons. I like the convenience of a pod coffee machine as much as the next person, but there’s no denying those machines are expensive and aren’t built to last. The AeroPress is a different story. The construction of AeroPress models has varied over the years, but the current version being sold is made of a BPA-free polypropylene. You can bang this thing around without any fear of breaking. My AeroPress (shown in a photo above) is the version sold from January through June, 2014, which makes it two models out of date. It was made from a weaker copolyester material, but I’m still using it nearly every day. Though I haven’t had any issues, the one part I’ve heard some people experience issues with is the rubber seal on the bottom of the plunger. After prolonged use, sometimes those wear down and don’t seal quite as well. They’re extremely easy (and cheap) to replace. The plunger, chamber and filter cap weigh 7 ounces — less than half-a-pound. And because it’s made of durable polyproplylene plastic, you can toss it in your bag and go without worry. The AeroPress was originally designed for brewing with fine or medium-fine grounds via the Standard Method. This grind size is perfect for creating a bed of grounds that’s the proper consistency for the AeroPress’ speedy, pressurized extraction method. With the Inverted Method the AeroPress can be used with coarser grounds, because the Inverted Method allows for extended steeping. When it comes to AeroPress vs French Press brew time, it’s no comparison. Combine the micro-filter (allows you to brew with a finer grind size) with pressure extraction (created by the plunger) and the AeroPress gives you a much more rapid brew time — usually around 1 minute. Simple soap and water will do, but the AeroPress is dishwasher safe, too. No matter how much anyone loves the AeroPress, it ain’t perfect. The exact steps vary for each of those, but the overall process is a lot simpler (and the AeroPress has more literal parts). I’d also argue the AeroPress takes the most practice to get “right,” by which I mean getting you to what you’d define as your perfect cup of coffee. By varying the grind size, water temperature and total contact time, you can significantly change the resulting coffee. This is awesome for those who like to experiment, but it can lead to inconsistency from cup to cup if you don’t have your process dialed in. A small annoyance, but the AeroPress requires special, circular micro-filters. 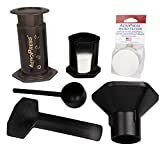 The AeroPress kit comes with 350 filters, which should last you 6-12 months, and the filters are cheap to replace off Amazon or directly from Aerobie. Total coffee capacity is a downside of the AeroPress. The product is designed to yield a coffee concentrate to which you add hot water until you reach your desired strength, but sometimes I still have to go back and make a second cup for myself. The French Press is the old school, tried-and-true method of brewing coffee. Imagine a fancy, refined European coffee house. Chances are there’s a French Press somewhere in your artificial field of vision. Though this coffee maker has a particular nation in its name, it may not have been invented by a Frenchman! The first patent for a French Press actually was taken out by a man named Attilio Callimani. If you’re thinking, “That dude sounds ridiculously Italian,” you’d be correct. French Press coffee is known for being complex and bold. This is especially obvious when it’s compared with AeroPress coffee. The AeroPress, stovetop coffee makers and vacuum coffee makers brew with pressure. Drip and pour over coffee makers brew with controlled flows of water. All of these methods require some degree of control, either human or mechanical. The French Press just sits there. You could completely forget your coffee is sitting there (except the fact that you can’t do anything productive until you’ve had your coffee). The French Press works with basic steeping. Hot water and ground coffee are combined for a period of time, and when you’re satisfied that extraction is complete you press the plunger to force the filter screen (and coffee grounds) downward. The resulting coffee is frequently described as “muddy” or “rich” or “full-bodied.” It’s almost like coffee unfiltered (except that, you know, it was filtered). French Press coffee is a very different experience compared to AeroPress coffee, but both are wonderful in their own ways. Compared to the AeroPress (or any coffee maker for that matter) the French Press is easy. Grab a mug (or mugs): Pour and enjoy! 1. Try a very coarse grind with a longer extraction time (more than 4 minutes). It could give you a super clean cup…if you’re willing to wait. 2. Don’t stir after adding the water! This will cause the ground coffee to sink to the bottom and condense, which takes your 4 minute brew time and makes it considerably longer. 3. Pour all coffee out of the French Press after plunging. This separates the coffee from the grounds and ensures extraction stops, preventing the addition of any unwanted bitter acids. Though the step-by-step guide above lists 9 separate steps compared to 10 for the AeroPress Standard Method, that belies the French Press’ ease of use. Grind your coffee, add hot water, wait 4-5 minutes, plunge to strain, enjoy. You can make almost any brewing method as complicated as you’d like, but the French Press doesn’t need to be. First, you don’t need to purchase paper filters or keep them in stock. Oils are a great carrier of flavor and so can enhance the taste of food and beverages. But they can also oxidize very easily, leaving a less than desirable note in your coffee. Oxidized oils are more prevalent in dark roasted coffees, older beans (more than 3 weeks after roasting) and pre-ground coffee. If you grind your own beans, and especially if you use light and medium roasts, the French Press will give you the most complete picture of your coffee’s true taste. Whereas the AeroPress makes one cup at a time, the French Press handles multiple. The exact volume depends on the model, but you can easily get 3-4 cups out of most French Press brewers. Tied to Pro #2 above, the French Press makes coffee like no other brew method. It’s complex, unrefined and utterly distinct. While not everyone will love French Press coffee, I’d suggest everyone at least try it! Wait, so I extol the French Press for making uniquely flavored coffee but penalize it for it’s sometimes murky consistency? This is all personal preference, but most times we talk about coffee we’re talking about a smooth cup of Joe. The French Press just won’t be as smooth. Because there’s no paper filter to discard, French Press users are required to do more cleaning. Maybe you prefer a coarse grind, maybe you don’t. With the AeroPress you have much more flexibility, but with the French Press it’s coarse grind or bust. Anything noticeably finer won’t strain as well and could end up resembling cowboy coffee more than you’d like. Generally, shorter is better than longer. The French Press takes longer than almost all other methods. This is due primarily to the necessity of using a coarse grind, which takes longer for complete extraction. AeroPress vs French Press: What Do You Think? Have you used both or either of these models? Which do you prefer? What do you think are the pros and cons? Comment below!